Blood may be the essence of life, but there are times when a physician needs to stop or redirect blood flow to treat a patient or even save his or her life. Using minimally invasive interventional techniques–an alternative to open surgery–embolic agents can be delivered through a microcatheter and implanted in tiny blood vessels to cut off blood supply to a particular area of the body. 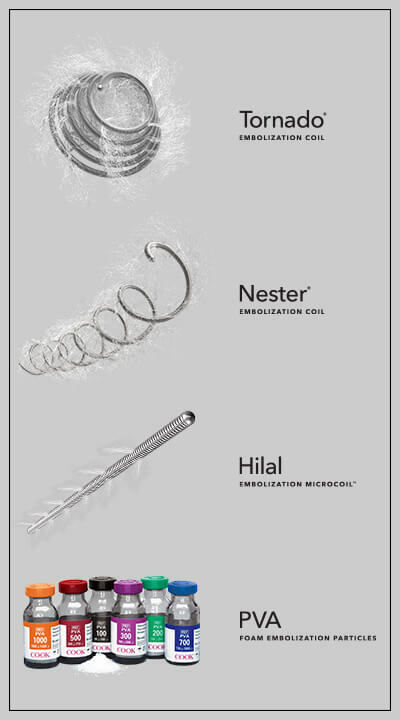 “Coils and particles stop blood flow by creating an occlusion,” said Clint Merkel, global program manager responsible for the Cantata Microcatheter line. Between them, Cook’s family of three Cantata Microcatheters are designed to deliver particles such as non-spherical PVA Foam Embolization Particles and microsphere, embolization coils, and other embolic agents, including glue or alcohol fluid, to very small vessels in the peripheral vasculature. The high-flow .027” inner diameter (ID) Cantata Microcatheter delivers relatively larger embolic agents to target anatomy while the .021” ID and .025” ID Cantata Microcatheters deliver .018” diameter microcoils and appropriate sizes of other embolic agents. 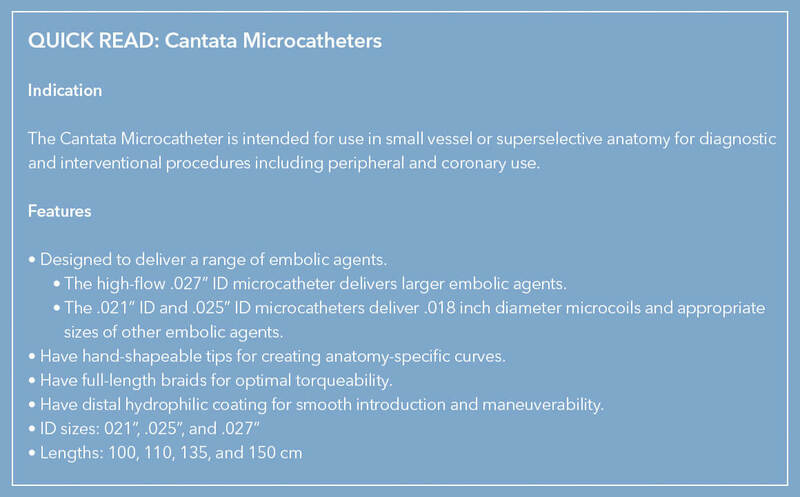 Each of the Cantata Microcatheters has a maximum particle size limit: 500 μm for the 2.5 Fr superselective Cantata, 700 μm for the 2.8 Fr superselective Cantata, and 1,000 μm for the 2.9 Fr high-flow Cantata. 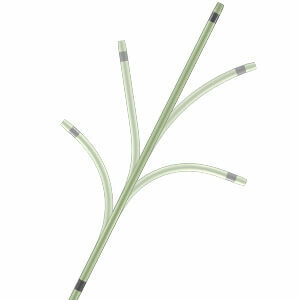 The hand-shapable feature of Cantata Microcatheters enable physicians to make anatomy-specific curves. Besides the unique hand-shapability of the braid tip, the microcatheter design also provides control, torquability, and kink resistance. To enable optimal trackability, Cantata’s full-length stainless-steel braid has five transition zones that provide a distinct yet seamless transition from hub to tip. The braid also has a distal hydrophilic coating to ensure smooth introduction and maneuverability through arteries and veins. To view the flow rate chart of different infusion mediums in the three Cantata Microcatheters, as well as ordering information, go here.